Two of my favourite things are flying and Christmas. Emirates has introduced a festive menu across all classes for flights from Dubai to Australia, Europe and the US for December. Passengers flying in first and business class will receive poached king prawns with Marie Rose sauce and fennel with lemon and herbs, a main course of rolled turkey buffé with chestnut stuffing, cranberry jus lié, pumpkin mash and Brussels sprouts with turkey rashers and cream and a desserts including chocolate pudding, chocolate and chestnut torte and Yule log (pictured above). First class passengers can also enjoy hot chocolate handmade with 100 per cent Valrhona chocolate, prepared by chocolatier David Franco. 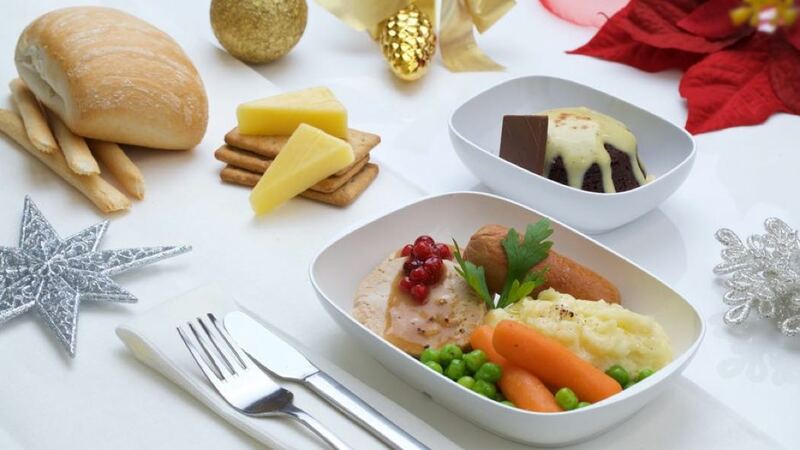 In economy passengers, rolled turkey buffé with cranberry jus lié is on the menu along with mashed potatoes, chicken sausage and seasonal vegetables, with festive chocolate pudding with spiced ginger custard offered as a dessert (pictured below). Emirates will also be offering Christmassy delights at its six lounges in Dubai International Airport. These include Basler Leckerli gingerbread cookies, Christmas cake and Stollen cake, while the first class lounges will also offer roasted turkey. Customers travelling with children can also enjoy a festive kids’ menu, which includes roast turkey, sweet potato mash, carrots and peas. A candy cane and Emirates-brand chocolate buttons are also offered as treats. Yum. In October 2016 I actually flew Emirates Business Class from London Heathrow to Cape Town via Dubai. The first leg of the journey from London Heathrow to Dubai was on an Emirates A380 and the second leg from Dubai to Cape Town on Emirates Boeing 777-300. Emirates also features in my top 10 best airlines for longhaul business class and I have also previously reviewed the Emirates business class on the Boeing 777 and business class on Emirates A380 along with Emirates in First Class.